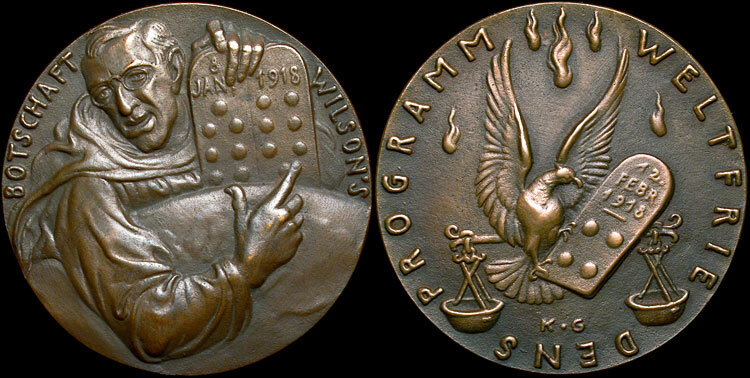 1918, Cast Bronze, Satirical medal, 58.1mm, 75g., Ex-Saginaw Valley Collection, Scarce. Obverse: "Message Wilson's Jan. 8,1918." Reverse: "Program of World Peace." The four points on the board are symbolic for the four supplementary points as declared by Wilson on February 12,1918. A crisply cast piece with nice milk chocolate brown patina. Cross-collected by President Wilson and WWI collectors.